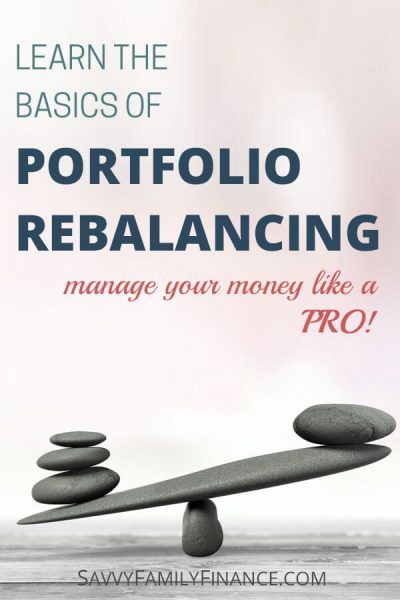 Inside: Learn the basics of portfolio rebalancing. You’ve started investing, whether by opening an IRA, enrolling in the company 401(k) plan or even opening a brokerage account. Yay! Now what? Well, just like your home, car, or body, your investments need an occasional tune-up, or rebalancing. After picking your portfolio and deciding on an asset allocation, you’ll notice that over time your portfolio may get a bit wonky. Why? The market moves, and sometimes some stocks will be hot, other days bonds will be on a tear. So basically, you’ll want to bring your portfolio back in line with your target asset allocation by rebalancing your funds. You can think of portfolio rebalancing as risk management. Let’s say you’ve decided your target allocation is 70% stocks and 30% bonds. Now, if the markets are doing well and stocks rise to 80% of your portfolio, that means you are taking on more risk than you may be comfortable with. In general, there will be larger swings with stocks rather than bonds, hence stocks tend to be considered riskier than bonds. At this point, you may be nervously biting your nails. There was a reason you only wanted 70% of your investments in stocks. You can pull your portfolio back into line with your risk tolerance, and ease that anxiety, by rebalancing your portfolio. If you opt to rebalance your portfolio on your own, just how often should you do it? One measure that is commonly cited is to rebalance once your portfolio has moved more than 5% away from your target allocation. However, if you are a younger, long-term investor, you could likely tolerate more variation and could decide to wait to rebalance once your portfolio strays 5%, 10% or more from your desired allocation. Ok, but how often is this? Again, if you are younger, it isn’t unreasonable to rebalance just once a year and then only if your portfolio needs it. As you get closer to retirement or are retired, you may want to check twice a year or once a quarter. Do keep in mind, more frequent trades may also mean more transaction fees and if you are dealing with taxable accounts, capital gains that are subject to taxation. Now you may ask, how do you rebalance your portfolio? Well, you can do it manually or automatically. When you manually rebalance your portfolio, you’ll want to list your investments with their asset classes and compare it with your preferred asset allocation. So, if you want 70% stocks and 30% bonds but currently have 80% stock and 20% bonds, that means you want to sell 10% of your stock holdings and buy more bonds with that money. You then initiate trades with your brokerage or in your retirement account to do so. Another situation may be where your overall stock holdings are fine, but of those stocks, you want 90% large-cap and 10% small-cap. However, if there was a recent run in small-cap stocks you may have 80% large-cap and 20% small-cap. In that case, you would want to sell some of the small-cap investments and invest the money in more large-cap. There are ways to set up your accounts so you can sit back and not worry quite as much. If you opted to invest in target-date funds or another fund that automatically rebalances for you, then you are done. The fund manager does the work for you. Of course, check up on any management or fund changes periodically (maybe once a year). Another situation is if you have invested your money in an automatically managed account, such as with Blooom, Betterment or Wealthfront. These robo-advisors will often rebalance your portfolio for you based on your given risk tolerance and goals. And finally, if you hire a financial advisor to manage your investments, she should rebalance your portfolio for you. Do discuss with the advisor your preferred frequency or how much deviation from your plan would trigger a rebalance. Rebalancing your portfolio is important. Doing so keeps your portfolio aligned with your goals by ensuring you have the right mix of stocks, bonds, and other investments. Mark a “checkup-date” on your calendar once a year to review your investments and make any wanted or needed changes.